From Ilmington to the highest point in Warwickshire. Ilmington and the highest point in Warwickshire. 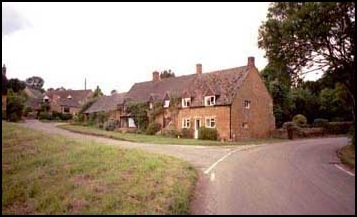 walking before returning to Ilmington and the Red Lion Pub, where they would get suitably "refreshed". Needless to say, as the sun was out and the walking looked interesting, we accepted. Soon after 10.30 a.m. we started off from Ilmington with appropriate clothing in rucksacks, in case the rain, that was forecast for later in the day, reached this area earlier than expected. tree growing through it and a body of water below us on our right, where we were lucky enough to see a heron standing on the bank. From here it was downhill, over a small wooden bridge and, with a field edge on our left, we went up hill, passing a large house on our left before reaching a lane where we parted company with the Heart of England Way. It went north and downhill but our route was south and a steep ascent up a lane. I'm looking at the view via my camera, Lynn's looking at the camera and Anne's watching her feet. It was a really good "pull" up this lane and we were all pleased to stop some distance up the hill when we came to a seat where we could take a break, enjoy the views and have refreshments. But soon we were off again tramping up the steep gradient and ignoring two rights of way on our left, which seemed to offer easier routes. 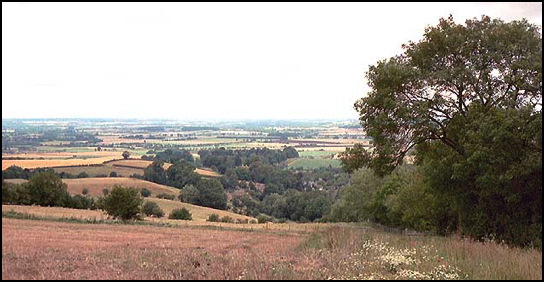 Our objective was the top of the hill, the top of Ilmington Down, which, at 856 feet above sea level, is the highest point in Warwickshire. Surprisingly there is no evidence of this "peak", unless I missed it. However, there is a radio station close by. 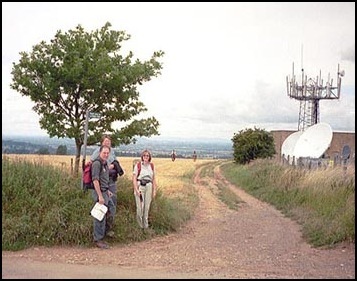 So if you do this walk remember when you are on this lane and outside this radio station you are on the highest bit of ground in Warwickshire. It was at this point Anne took the opportunity to ‘phone our eldest son Greg to say "Hi Greg, guess where we are?" "Up some mountain?" was his reply. He’s always telephoning us to let us know he’s on the top of Snowdon or Kinder Scout so we thought we’d tell him we were on the highest point in Warwickshire. Where was he? Buying some walking socks in Manchester. 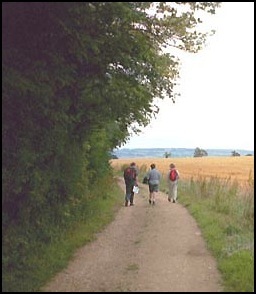 Having reached the top of the hill we now then went left (east) along a field track, passing a cornfield on our left, and soon we reached the road between Ilmington and Hidcote Boyce. 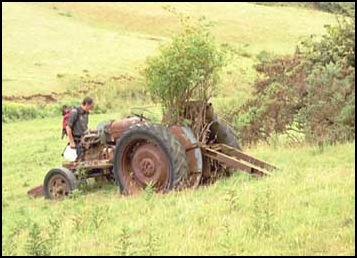 Initially Larry and Lynn had intended to follow this right of way, which continued on the other side of the road. Lynn and Larry had done this part of our route before. However, the sun was still out and so it was decided to take a minor detour, which we were very glad we did. So we turned right at the road (south west) and followed it uphill until it curved to the right. At this point we turned left along a very pleasant track, with woodland - Madgecombe Coppice - on our left. Soon the track did a 90-degree bend to the right. Fortunately we checked the map just in time as our route went left through the trees and downhill with glorious views to the north and east towards Foxcote Farm, which we passed on our left before reaching a lane. At this point we went left, passed the farm, and going downhill we passed a large straight tree - probably a spruce or something similar - before going uphill with trees on both sides. Soon we came to open pastureland on our left and on our right a high hedge protecting Foxcote House. It looked a beautiful building when we saw it, through a gateway, a little further on. At this point a check of the map indicated our route was still on this main lane/track (so we ignored the right of way to the right). This was very nice walking with wonderful views back to the house. Soon there was a right of way sign on our left which we followed uphill until we reached the top of a ridge with views to the north towards Ilmington and south back towards the area we had just passed. Along this ridge going east to west is Pig Lane and if we had turned left here it would have taken us back to the road we had reached after leaving the top of Ilmington Down. 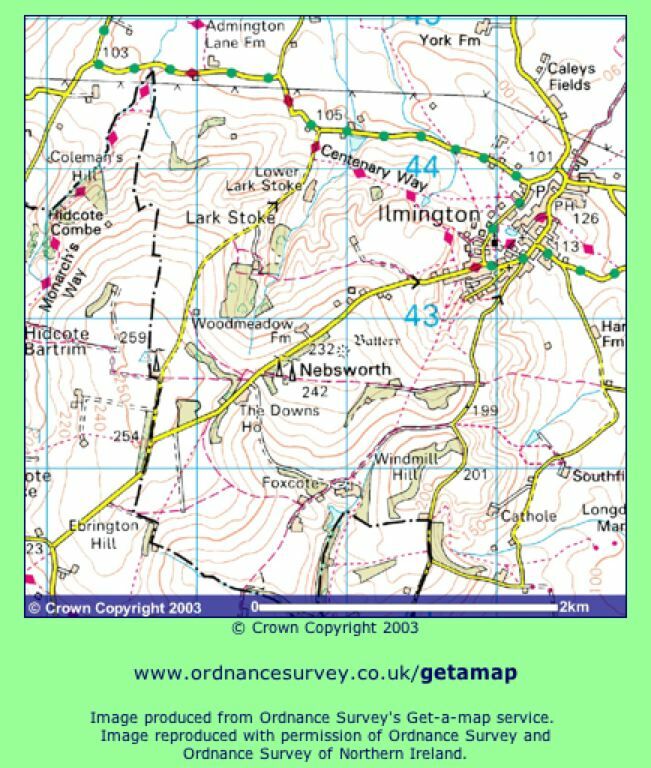 But our route was north and downhill and less than 30 minutes later we were back in Ilmington enjoying liquid refreshments at the Red Lion Public House. ‘Twas a nice pint of bitter. And I think Lynn liked her pint of Guinness which she consumed with great enjoyment - or was the enjoyment because she was sitting next to the Larry? 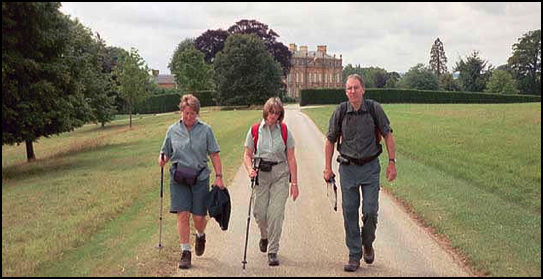 Left to right - Anne, Lynn and Larry with a backdrop of Foxcote House.